Micro Propagator + Zambeza Seedkit: The Best Combination for Successful Seed Germination! Get the Zambeza Micro Propagator Plus combo kit and say goodbye to your germination problems. 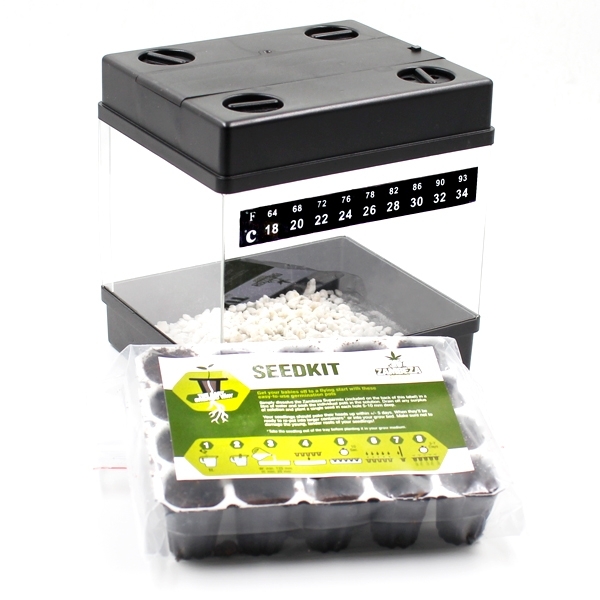 Give your seeds an always constant and well-regulated environment for optimal growth and max out your seed germination rates with the Zambeza Micro Propagator Plus germination kit. The Micro Propagator helps to maintain the best conditions for always-reliable seed germination. It comes complete with a bag of Perlite, a LED grow light and a thermometer strip.The propagator measures 13x10x13cm and it goes perfectly with our Zambeza Seedkit which is included as well. The Zambeza Seedkit consists of 15 easy germination pots that provide everything you need for the best start of your cannabis seeds. All you need to do is add some water. The Zambeza Seedkit fights perfectly into the Micro Propagator. The Zambeza Micro Propagator Plus germination kit is ideal for first-time growers but can be also recommended for small grow ops who want always-consistent and reliable conditions for seed germination. The kit is also suitable for clones.